We ship USPS priority for most domestic and all international orders. Larger domestic packages will ship via UPS or Fedex ground. All packages are insured with tracking. We refund any difference if the actual shipping costs end up being less than what we initially charged. Please call or email us if you have specific shipping needs for your purchase. Do I have to pay customs fees for international packages? It will depend on which country we are shipping to, but most countries do charge a customs fee, which the buyer is responsible for paying. Please check with your local post office before placing an order with us if you are concerned about potential charges they may have. We ship every international package USPS Priority Mail, with insurance and tracking. If you would like us to ship your item to someone you trust within the US so that they can ship it you in a less expensive way, then please feel free to contact us. Please note that all warranties and insurance for shipments are based on our original shipment and we do not accept responsibility for any loss or damage after the initial shipment. We can ship UPS or Fedex for international items that are oversize or if you prefer this method of shipping. Please contact us for quotes to see what is possible before placing your order. These options tend to be significantly more expensive than USPS Priority Mail. Online and in-store orders are usually shipped within 3-5 business days, unless stated otherwise. Pieces from current exhibitions will ship within the month following the end of the exhibit. Once shipped, you will receive an email confirmation with your tracking number. How do I purchase art work from a current exhibition? When emailing please include the title/ price and artist name of each piece you are interested in. If you are interested in several pieces, please put them in order of priority. ***Please specify if you would like to purchase more than one piece. Please include a mailing address and phone number you can be reached at if we have any questions (for US and Canada only) if possible. We try to first limit one unique original per artist per household and sell additional pieces based on demand. A non-refundable 50% down payment must be made or reserved items will be offered to other interested buyers. Please be patient in waiting for a response and please understand that our most popular shows sometimes receive hundreds of emails and highly sought after pieces may sell immediately. All emails are answered in the order in which they are received. Can my retail store buy wholesale directly from Circus Posterus? Currently we allow some brick and mortar stores to purchase prints, certain books, and some toys/ figures wholesale directly from Circus Posterus; the discount varies by product and artist and there is a minimum purchase required with every wholesale order. Please contact strangerfactorygallery@gmail.com for more information on what is currently available. I am an art dealer or gallery and am interested in getting specific works for my own clients. Do you offer dealer discounts or allow your inventory to be consigned by other galleries? I received my order but something was broken, damaged, defective, etc. What should I do? While shipping issues are rare, they can occur. In the event that you have a problem with your shipment, please contact us as soon as possible. You must keep all packaging and the box. Depending on the carrier we will need additional information along with pictures. Please send a detailed email to: strangerfactorysales@gmail.com explaining the nature of problem, including photos of the box, packaging and item(s). We will do our best to respond within 24 hours, with a possible solution or request for more details, if needed. I have an idea for an event, gallery show, exclusive or exhibit and think it may be a great fit? Who do I contact? Please keep in mind reasonable time-frames for your project. Most artists require at least 6 months of advance notice to accommodate their busy schedules. Toy projects can take anywhere from 6 months – 2+ years. If you are a licensing company and would like to discuss production ideas with a CP artist, please email us at strangerfactorygallery@gmail.com. We will review that project directly with our artist(s) and get back to you as soon as possible. How do I get on your mailing list to get news on sales and events? How do CP’s print and figure editions work? Most of our projects in print and 3D are ‘editioned’ – which means that CP works with an artist on a project in advance and that artist is involved entirely, from design to prototype, to final production. From there, they are lead directors on everything from color to effect to finish and CP helps guide them through that entire process. During this time, we establish with the artist the edition size and pricing. The run-of-the-mill formula (for both prints and toys) is based on a tried and proven formula: ‘actual’ edition size + 10% of an edition for artist proofs, + 1 production proof that is archived by CP. Often artists will allow us to sell their artist proofs directly to fans, which are then often mixed into available stock. CP does not sell their production proofs and produces them only for the purpose of archiving them. Who makes the Circus Posterus toys & figures? All of our own limited edition and one-of-a-kind figures start with either the artist sculpting them from start to finish, or with industry-leading sculptors and 3d modelers. We then partner with a casting house to then create a prototype and the edition of blank casts. Those casts are then shipped to Albuquerque where they are cleaned up, sanded, sometimes modified with additional sculptural elements, then hand painted. Sometimes it’s also a combination allowing the signature artist and sculptor/ production team to collaborate back and forth. All of our high quality limited edition resin figures are made here in the US. Circus Posterus has also joined forces with our Japanese partner Tomenosuke to create Tomenosuke + Circus Posterus, a new line of handmade Japanese vinyl figures known as Sofubi (soft vinyl). We also partner with other small toy companies like Cardboard Spaceship and Kidrobot for larger vinyl production runs made in China. We are always looking for additional licensing partners with new products that are unique to our marketplace. Please contact us if you feel your project would be a good fit for us. Who creates your fine art prints? Our small print team of professional photographers and designers with pre-press histories (traditional offset publishing through digital editions or giclée producing), as well as formally trained traditional printers that oversee all of our print projects. From books, to digital editions on paper or canvas, to silk-screening gig-posters and fabric, we have top talent on board with all of our projects. Every one of our projects is handled internally and made in the US. All giclée prints sold on our website and through our retailers are printed here on site with either an Epson 9880 or 7900. Both use archival inks. Will you make a custom print for me? If you are interested in prints from our artists, please visit our PRINTS section to see our available prints – if you would like to suggest a print that is not yet available from a specific artist in our collective, please let us know. If we receive enough requests we will do our best to make an edition happen. Do you offer blank versions of your toys? Currently DIY (Do-It-Yourself) or blank figures are not available at this exact moment outside of the DIY Wandering Misfits minifigures, but CP is in the planning stage to see how we may offer them to you in many different ways. Can I commission or hire out a CP artist for commercial projects, development or design? Yes, if this is a serious inquiry (marketing purposes, entertainment design, film/animation) and if the concept and style pairs well with the aesthetic of the specific artist(s) that are part of our collective, we are interested in hearing about your project. 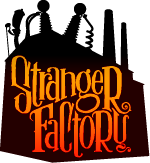 If you are a Producer or Art Director, please do not hesitate to contact us: strangerfactorygallery@gmail.com. Circus Posterus serves as a first base, though all serious inquiries are forwarded to the artists, who then determine if they want to handle contact directly, or through CP. I’m an artist, can I join Circus Posterus or submit work for consideration at Stranger Factory? Stranger Factory is now accepting artist submissions for upcoming group shows and our 2016/2017 exhibition schedule is filling quickly! We feature contemporary character design and illustration, focusing on emerging and mid-career artists with a dedicated vision to narrative work. Serious inquiries only. You may send us a link to your website or online portfolio, but please DO NOT send us photos. We will NOT open attachments or respond to emails with files attached. I emailed CP/Stranger Factory, why haven’t you written me back? We try to respond directly to everyone that contacts us, though we receive so many emails that we do ask for your patience. We try to respond to all inquiries (except submissions, see below) within 24-48 hours, however it is possible, due to the number of emails we receive, that yours may have been lost in the mix. If you’ve sent us an urgent message and don’t hear back from us within 48 hours, please try again. If you are awaiting a response to your artist submission, please understand that we review submissions on a quarterly basis and try our best to respond to everyone.